It's the start of a new era at Uber. Incoming Uber CEO Dara Khosrowshahi was formally introduced to Uber employees at an all-hands meeting on Wednesday in San Francisco. 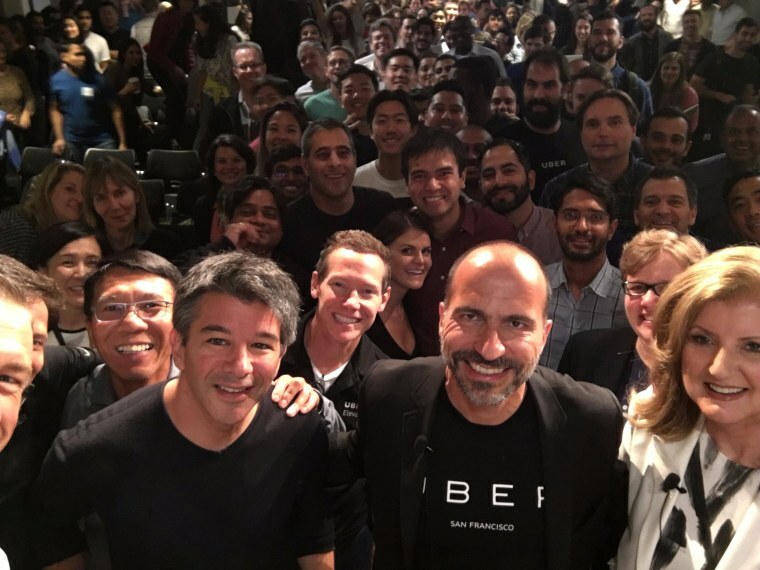 In a show of solidarity, Khosrowshahi posted for a group photo next to ex-Uber CEO Travis Kalanick, board member Arianna Huffington and employees at the company's San Francisco office. Huffington shared the photo on Twitter and added that Khosrowshahi, who is leaving his job as CEO of Expedia, will start at Uber next Tuesday. It's been a long, tumultuous summer for Uber and its CEO search. Kalanick resigned in June after receiving pressure from the company's board of directors. However, the process to find his replacement was hardly smooth. Various reports have suggested Kalanick wanted to return as CEO one day and maintain his influence at the company he co-founded. Two candidates were mentioned as the main contenders dividing the board: Former GE CEO Jeff Immelt and Hewlett Packard Enterprise CEO Meg Whitman. However, it was Khosrowshahi, the consensus candidate, who received unanimous votes during a board meeting on Sunday. He'll have his work cut out for him as he steps up to lead Uber. Not only will Khosrowshahi be tasked with helping the company turn the page after its sexual harassment scandal, but he'll also need to get to work filling many leadership positions at the company that have remained vacant.